Plastic parts are now commonplace in consumer product design, and for good reason. Highly durable, endless color options and of course, an inexpensive option when manufactured in high volumes. For the engineering and design team at URB-E, it was a no brainier to utilize plastic components for the fenders and battery hub in order to ramp up its production. But does this mean you have to be an expert in plastics parts to be able to design one in SOLIDWORKS? Before we answer that questions, let’s take a closer look at some critical design factors that govern a healthy plastic part design. The need to have drafted walls on injection molded plastics parts are simply an unavoidable design feature. Having the right draft angles would ensure the part easily slides out of the mold when ejected and avoid any costly damage to the plastic part and mold. Using SOLIDWORKS, you can easily identify faces in your 3D model that require draft angles using the draft analysis tool. This was an important step in the part seen below, which is the battery case cover for the URB-E. This part was initially designed for form and function and 3D printed, meaning drafted walls were not considered in the initially design stages. 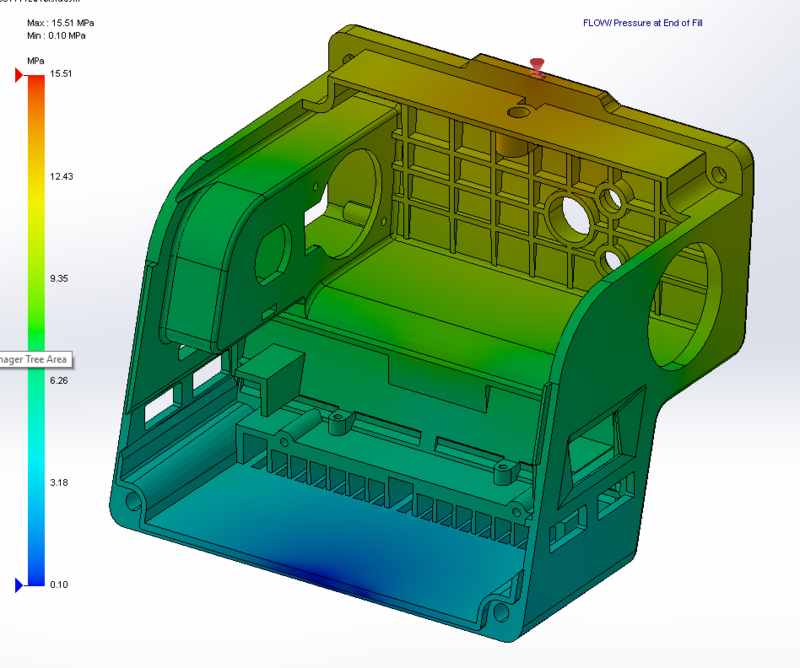 To use the Draft analysis tool, simply select a face that is parallel to the pull direction (direction out the part slides of the mold) and specify the minimum allowable draft angle. The 3D model will then be colorized to show faces with positive, negative or no drafts. In addition to ensuring the part ejects without any issues, the positive or negative color codes will help determine where parting line and or shutoffs could be located. Undercuts in the plastic part design could cause the part to be stuck within the mold after it has formed. This typically results in a lot of redesign time and mold reworks, which can be very time-consuming and not to mention costly as well. Undercuts should be avoided at all cost. Similar to the draft analysis tool, the Undercut Analysis is located in the Evaluate tab. The undercut analysis tool allows the user to specify either the pull direction (like the Draft analysis tool) or the actual parting line to identify features that may cause undercuts. Looking at this image above, we seem to be in good shape for this URB-E battery case cover. 3) Will the part fill during injection molding? 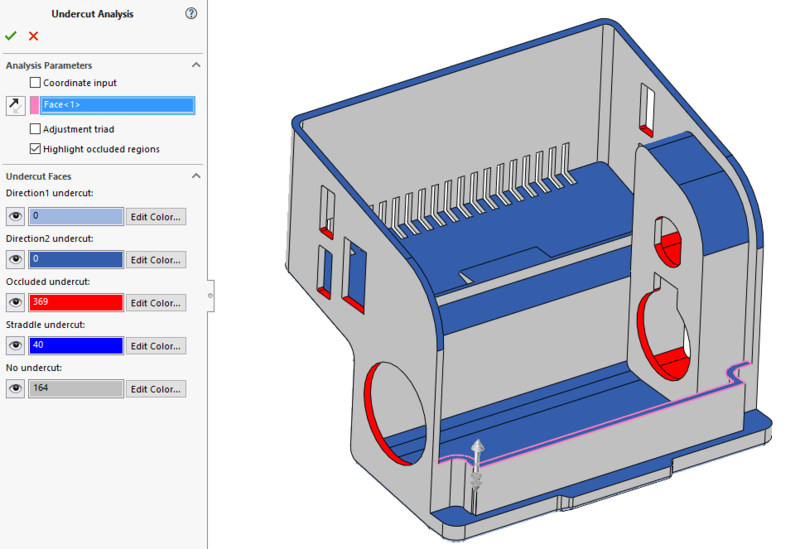 SOLIDWORKS modeling tools such as shelling, ribbing and surfacing help a designer model plastics parts quickly and easily. However, the age old question is: will the plastics part fill completely within the mold? Wall thickness, injection location, material viscosity and injection pressure are few parameters that can determine if the part forms completely or experience a short shot. 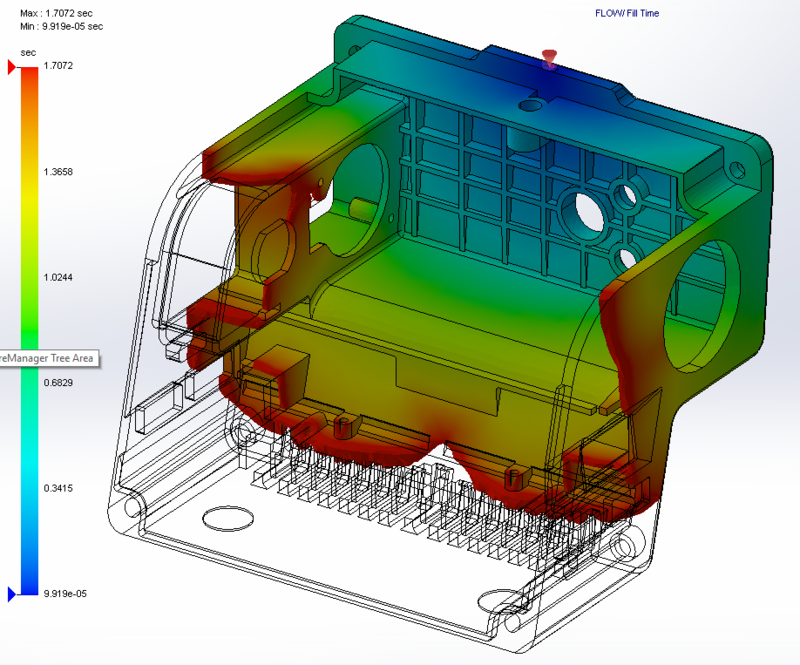 SOLIDWORKS Plastics uses intuitive, easy-to-use tools to quickly determine how the mold will fill. If gives uses an inside look into how the liquefied plastic flows and forms within the mold cavity. In addition to viewing the flow, SOLIDWORKS Plastics will help a designer determine if any features are causing a difficulty in filling or if spikes in injection pressure would in turn cause gate freezing issues. Being able to identify these flow problems early will help the re-design process of the part without having to guess the most optimized design. 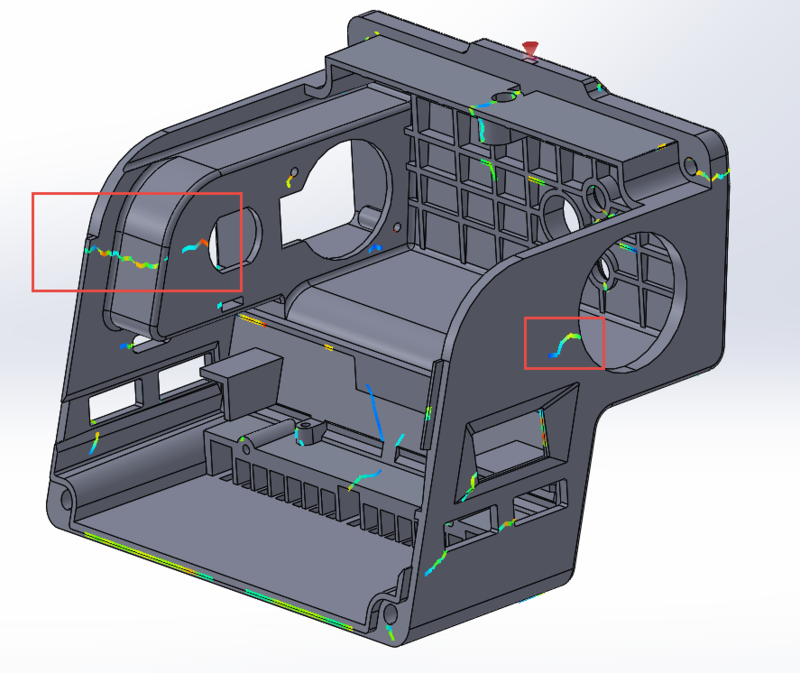 To take this a step further, SOLIDWORKS Plastics also identifies weld lines within the model at the end of the filling stage. For example, with this battery case, weld lines in critical areas could cause the part to break during operation if it endured a high-force impact on it, such as the URB-E riding over a pothole. Weld lines can typically move to non-critical areas by modifying the geometry or changing the gate location. Both can be done quickly within SOLIDWORKS Plastics to see how the changes would effect the filling process. So, what is the answer to question that opened this article? 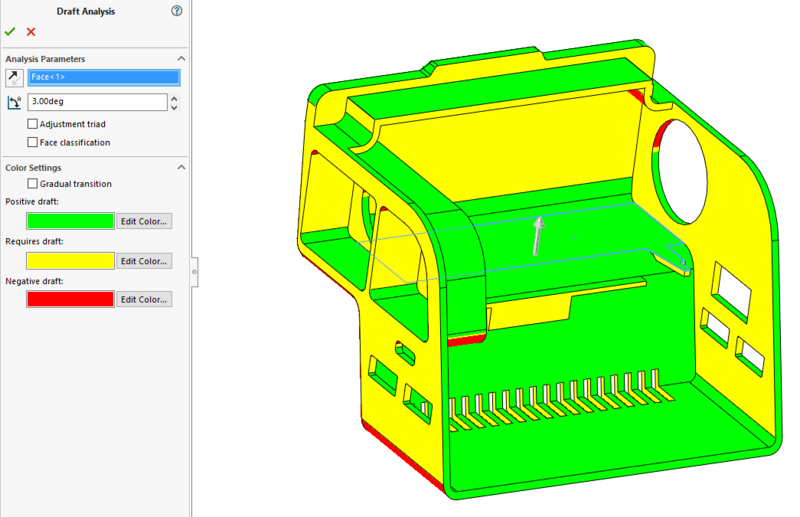 Using the tools that are fully integrated within SOLIDWORKS, there is little to no reason why a less experienced plastic part designer wouldn’t be able to design a functional plastic part.